Approximately two weeks before the game's story, Nanase was attacked by a Void. Fortunately, Hyde managed to save her although the Void's bite triggered her transformation into an In-Birth. Due to her lack of information regarding In-Birth, she believed that Hyde was responsible for her becoming a "monster" and has since been stalking him to exact her revenge and force him to "take responsibility". When the Hollow Night begins, Nanase feels that it is the ideal time to settle her vendetta against Hyde and seeks him out, completely unaware of the dangers the Night brings. On the way she encounters Vatista (who herself had just recently encountered Hyde) and, due to Vatista's rather vague description on her encounter, believed that Hyde forced Vatista to satisfy a cosplay fetish. When Vatista doesn't reveal Hyde's location, Nanase fights her. Later, Nanase meets Linne and identifies her as the girl who's always with Hyde. 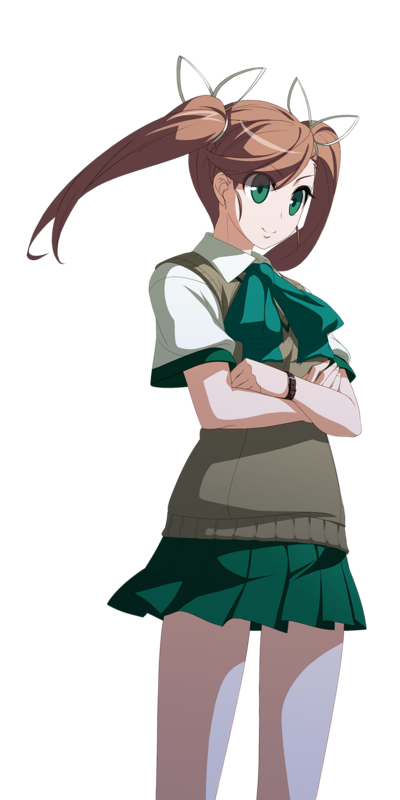 Nanase expresses her distress at her condition, but due to her unclear description, causes Linne to think that Hyde had a sexual relationship with her. When Linne refuses to reveal Hyde's location, Nanase fights her as well. Afterwards, Nanase encounters Orie and once again uses double entendres to express her distress, causing Orie to think that Hyde had sexually assaulted her. When Nanase is once again denied Hyde's location, she fights Orie. Nanase then reaches the Altar and encounters Hilda. When Nanase's frustration at not finding Hyde finally reaching it's peak, she fights Hilda as a warm-up for her future fight with Hyde and wins. Hyde then shows up and is surprised to see Hilda already defeated. Having found the object of her vendetta, Nanase demands that Hyde take responsibility for his actions. Vatista, Linne, and Orie then show up, each asking Hyde if what Nanase told them was true. Hyde, who is completely unaware why they are all angry at him, decides to try calming Nanase down by fighting her. When Nanase wins, Hyde flees with the four girls chasing after him. The girls lose sight of Hyde and Nanase begins complaining about how, because of Hyde, she's now an In-Birth. Realizing that the entire situation was all a misunderstanding, the girls explain to Nanase the real reason why she's an In-Birth. Accepting that Hyde isn't the one at fault, Nanase decides to let go of her misguided grudge but insists that she isn't doing it to be nice. 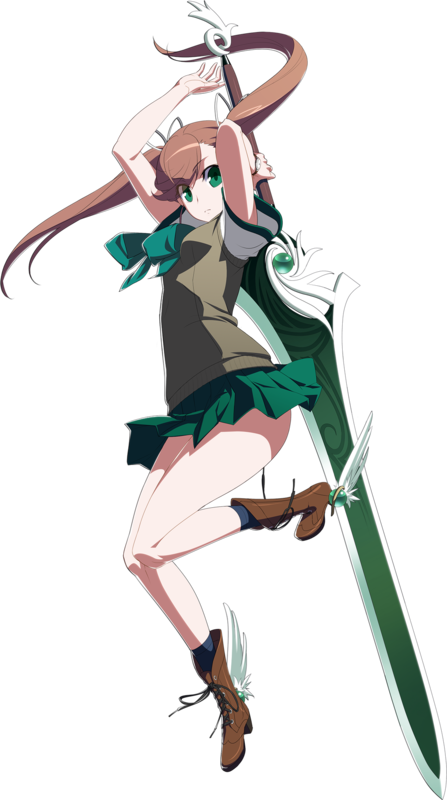 Hmm... where have a seen a cutesy anime schoolgirl with pigtails and a big sword? ...How about in EVERY doujin fighting game ever? lol. Why do they even keep making designs like these? 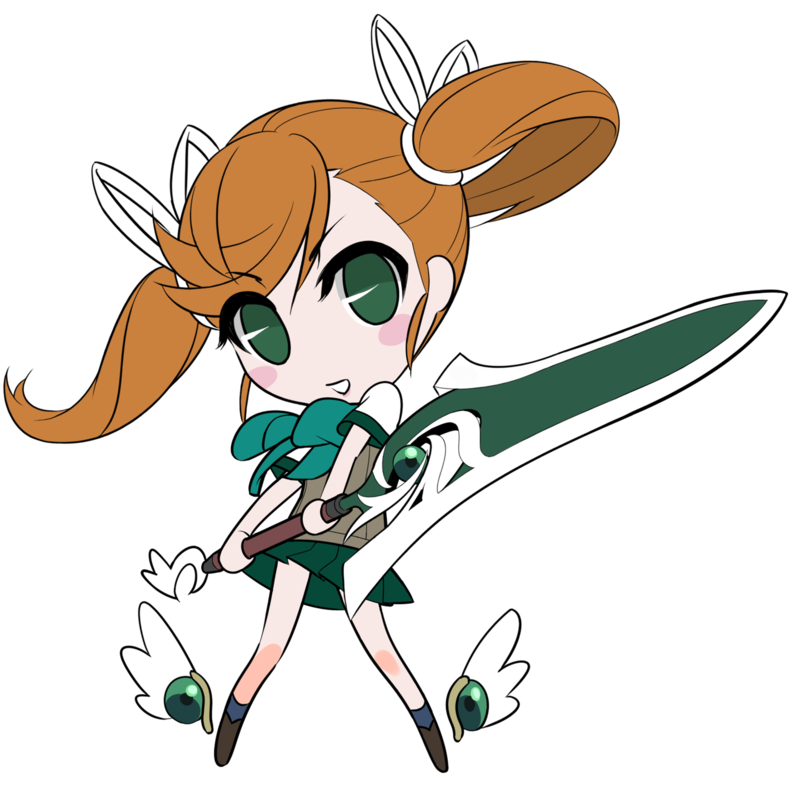 -__- It's funny, because Nanase was ADDED to UNIEL's original roster in the EXE:Late update. 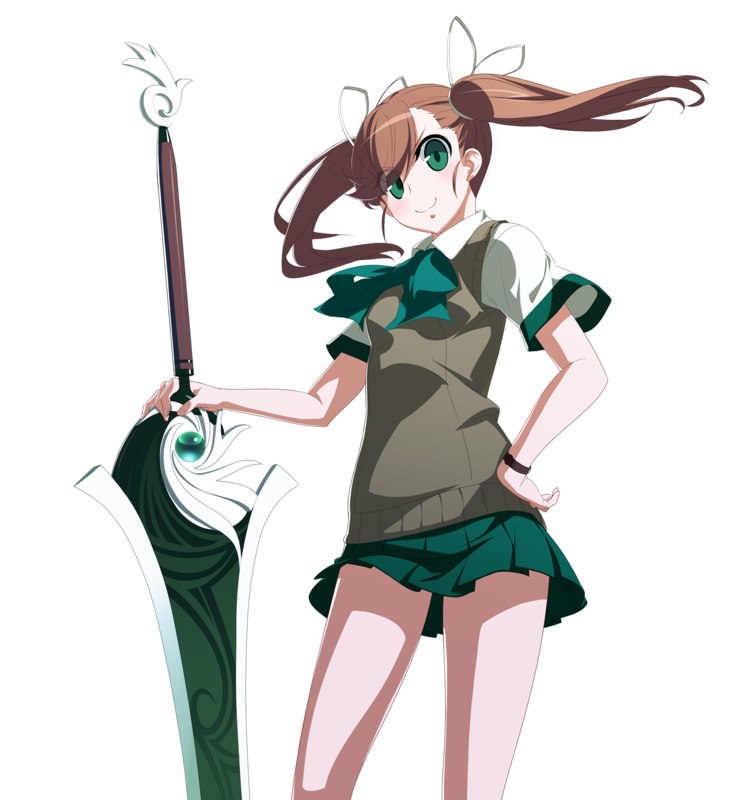 The game was almost free of super cliché anime characters, but of course... they just couldn't resist... they just had to put a schoolgirl with a sword in the damn game. lulz. No, I didn't find Nanase very interesting at first glance... but of course I tried her out in the game. As far as schoolgirls with swords goes, she might be the most fun out of any that I've seen. She's got some cool slash moves, specials & combos... and her air "hurricane" projectile has a pretty cool trajectory. Her facetious "out for revenge" storyline against Hyde is kinda funny, but at the end of the day, she's still not a very original or interesting design to look at. On a side note, I had to lower my TV speakers due to her voice being so abrasive and annoying. True story.